The first morning of the inaugural US U23 Greco-Roman World Team Trials got off to a flying start at the Mayo Civic Center in Rochester, Minnesota with established stars like Alex Sancho (66 kg, NYAC/OTS), Jesse Porter (75 kg, NYAC/OTS), Jon Jay Chavez (75 kg, NYAC), and Barrett Stanghill (85 kg, Minnesota Storm) all advancing to this evening’s best-of-three finals. But these events held on US soil are just as important for the athletes trying to make a name for themselves, and since there are only so many chances to do so, this tournament provides the setting for the kind of suspenseful moments and inspired performances that only happen when everything is on the line. Sure, the wrestlers who were expected to remain standing at the end are on course to do so, but if that was all you were looking for, you missed out on one helluva show. Sancho’s march to the semifinals was predictably dominant. In his first bout of the morning, OTS teammate Britton Holmes was able to hang in there for most of the first period and even owned a 1-0 advantage before Sancho scored on a takedown with under a minute left. From top, the native Miamian used two consecutive straight lifts to run up eight points and a 10-1 tech win. It was a similar method of destruction in the quarterfinals. The action was scoreless between Sancho and Riley Briggs (NMU/OTS) when the former got behind and lifted Briggs twice in a row to tack on a quick eight points. 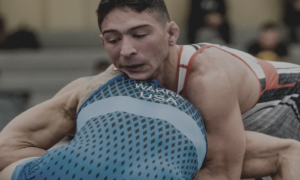 Lenny Merkin (Princeton WC) advanced to the semis on the strength of a grinding 4-2 win over 2015 Junior World Team member Travis Rice (NMU/OTS). Rice owned a 1-0 lead in the opening period when Merkin scored two on a correct throw. The second frame saw Rice receive another passivity point, only to have Merkin immediately scramble behind for another pair, which would account for the balance of points in this one. Composure is one of Sancho’s best attributes as an athlete, and that would come to serve him well in the early stages against Merkin. It seemed like there would be sparks right away, you just didn’t know when. Merkin kept a lower stance and when Sancho went to jut in an underhook, Merkin transitioned into a beautiful lateral drop that was not only good for four, but momentarily had Sancho in danger of getting pinned. Soon after they returned to their feet, Sancho swooped behind for two and looked for a straddle lift that he appeared to score two on before it was called off. Following another restart, Merkin lowered in on a high dive and forced Sancho to belly-down. 6-2, Merkin. But the lead was fleeting. With a mere :05 remaining in the first, Sancho grabbed two when Merkin missed on a headlock and then earned himself four more from a straddle lift. Just like that, the momentum had swung in the other direction and Sancho was out in front 8-6. 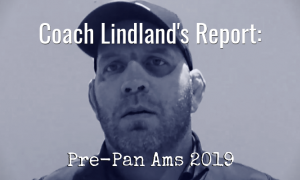 Perhaps just as incredibly, no further points were scored in the second period and Sancho now prepares for his fourth World Team Trials finals appearance since 2015. Marine Xavier Johnson, who made waves last year with his impressive performance at the US Nationals, moved up to 66 kilograms for this event and he looked just as explosive as he piled up a quick 6-0 lead on Rudy Guillen (Minnesota Storm) in the quarterfinals. :30 remained in the first when Guillen bodylocked Johnson with his back to the boundary for four points. In the second, Guillen head-pinched Johnson to his back for four and exposed him for two — 10-6, Guillen. He’d tack on another point via step-out later on to end his blitz of 11 unanswered points and walk away with the victor. 2014 University World Team member Sahid Kargbo (Patriot Elite) got going quickly in his quarterfinal bout versus Mason Hartshorn (NMU/OTS). Hartshorn came close on an arm throw, but Kargbo was able to shake out of it. Upon the reset, Kargbo latched on double overhooks and brought Hartshorn to his back where he transitioned to a headlock and squeezed it for the fall at only :45 into the bout. Assumptions often lead to error, but the thinking was that a bout between Kargbo and Guillen would mean fireworks and lots of them. Two dynamic scorers who like to open up and have shown a preference for big moves tends to result in a lot of offense. There was offense in this match, it was just one-sided. Virtually at the whistle, Kargbo went back to those double over’s versus Guillen and he used the hold to score two on a correct throw in the first :12 of the bout. Back on their feet, both wrestlers locked up in the clinch and it was Guillen who went for the throw. However, Kargbo instantly adjusted to land on top and pick up another pair of points. From there, he got his lock and gutted Guillen over twice to end the proceedings via an 8-0 tech. Sancho and Kargbo last met in the quarterfinals of the 2017 Senior World Team Trials with Sancho coming out on top 12-6. Chavez’s day began with a 10-0 tech over Ryan Cummings (NMU/OTS) while Mason McDaniel (Southern Illinois TC) appeared to be clicking on all cylinders when he pinned Colby Baker (NMU/OTS) and managed to take advantage of a par terre opportunity against Corey Fitzgerald (NMU/OTS). Fitzgerald was wrestling well up to that point but could not defend McDaniel’s gutwrench and was rolled out en-route to a 14-6 tech loss. McDaniel did not get a chance to repeat the maneuver against Chavez. The two jockeyed for position to start with Chavez prowling for his two-on-one. There wasn’t much doing, but he held position well, leaving McDaniel forced to weave back in. Soon enough, Chavez eased behind for two and lifted for four. When he brought McDaniel back down to the surface, he initially looked like he was going to go for another lift, but instead, gutted McDaniel over one more time to call a halt to the bout at 1:20 of the first period. Porter broke out the firepower against stablemate Giuseppe Rios (NMU/OTS). During that affair, Porter nailed one of the fastest arm throws you’ll ever see before following up with a four-point straddle lift to seal it all up. 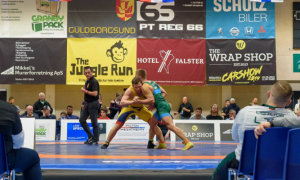 Curt Calovecchi (NMU/OTS), wrestling for the first time since winning the University Nationals last June, earned a fall over Jaron Chavez (NYAC/FLWC) to open his day of competition. The semifinal match between Porter and Calovecchi offered a tense atmosphere. Calovecchi has improved greatly and Porter, the more accomplished and celebrated of the two, is still working with potential that has not yet been unleashed in full. Both wrestlers found the sledding to be tough and opportunities to score were naturally not abundant. Porter received the first passivity point of the bout, but sure enough, Calovecchi checked in with his own soon thereafter. Calovecchi then moved Porter off the edge to collect another point and snare a temporary 2-1 lead heading into the second period. Calovecchi managed to get in on Porter’s body right as the conclusive frame commenced but just when he made contact, Porter secured double overhooks to drive him to his back. 5-2, Porter. A point rang in for Calovecchi when he reversed position, but that would be as close as he’d get. The action wasn’t tight so much as it was measured. Neither wrestler wanted to make an mistake and since they train in the same room, there weren’t going to be a lot of surprises between them. Calovecchi did do what he could to get back to the body or create motion inside of the ties, but Porter’s superb balance and ability to control his own tie-ups won out with a final score of 5-3. Porter and Chavez have met twice this past year — once in the consolation semis of the World Team Trials and again in the semifinals of the University Nationals with Chavez winning both bouts. 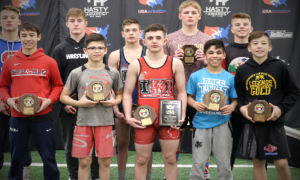 No one in this entire weight class comes close to having the same amount of experience Barrett Stanghill (Minnesota Storm) possesses, but with that experience is also an awful lot of ability, which the Montana native put on display in both of his bouts this morning. Trey Hardy (NMU/OTS), a still-learning-the-ropes kind of Greco wrestler, was first on the agenda for Stanghill, who used a takedown, a lift, and another takedown to move on 10-0. The semifinal contest ushered in Richard Robertson (BRTC), who advanced thanks to a pair of gritty wins over NMU mainstay Austin Chaon and Matt Reed (Tiger Wrestling Club), respectively. Unfortunately for Robertson, he was outgunned from the start. Some in-fighting cracked this one open, but Stanghill was moving with confidence as he scanned for opportunities. Eventually, he swarmed behind Robertson for a straddle lift and then once he finished the first score, held on for another and an 8-0 tech. The semifinal pitting 2017 Junior World Team member Wyatt Koelling (Missouri RTC) against Rich Carlson (Minnesota Storm) had all of the makings of a hard-hitting dustup and it didn’t disappoint. Koelling advanced to the semis with blink-and-you’ll-miss-’em tech’s over Gregory Kleinsmith (NMU/OTS) and George Sikes (NMU/OTS), although the match with Sikes saw a prolonged conference between officials and coaches before it was all sorted out. Carlson defeated Vaughan Monreal-Berner (Marines) in his quarterfinal bout 12-4. Monreal-Berner actually led that match 4-2 towards the end of the first when Carlson bulleted him down with a four-point headlock. In the second, Carlson capitalized on a headlock attempt by Monreal-Berner, converted it into a takedown, and then rolled him out twice to end the onslaught. Those watching Koelling/Carlson should have expected a tactical match where positioning and the ability to control where and how the tie-ups took place mattered most. This was evident throughout most of the first minute, as neither wrestler could break the other’s defenses. Carlson seized the first points on an arm throw attempt he came out the back door on. Back to their feet they were, with Koelling patiently resuming the fight. Carlson wanted to work from his right underhook but couldn’t find an angle to move the hold into a more favorable position. The final three minutes didn’t offer much in the way of action, but that doesn’t mean there was a lack of drama. Koelling, only down by two, was just a sequence away from turning it around. The problem for him was both Carlson’s work-rate and tenacity. He didn’t stop moving, and with a little over a minute left in the bout, a passivity point rang in to widen his lead to 3-0. Koelling doggedly tried digging in and moving forward. Carlson sustained the pace and activity necessary to stay in command the rest of the way. Stanghill and Carlson might be teammates, but they, too, have a prior history. Stanghill defeated Carlson in the finals of the University Nationals 5-2. 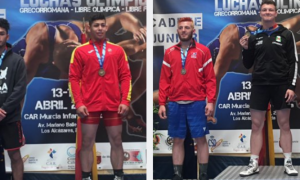 2017 Junior World Team Trials winner Blake Smith (NMU-OTS) might be in the finals, but it was his semifinal opponent (and NMU teammate) who really made news. Earlier in the day, Spencer Wilson defeated two-time NCAA Division I National champ Gabe Dean (NYAC/FLWC) via surprising technical fall. Wilson gave up two on a caution-and-two for finger-grabbing, but he was rather undeterred. Instead he hawked in on Dean and began to find success controlling both the ties and the tempo, with the Cornell alum trying to reach up for front headlocks. As the first period wound down and with Dean pressuring in, Wilson zipped an arm throw for four. Dean attempted to regain his footing near the edge but did not have the base to do so, and Wilson immediately drove him right back down for two more — 6-2, Wilson. Following a time-out for blood, the NMU wrestler wrapped it all up with another four-point arm throw, this one even more dramatic than the first. 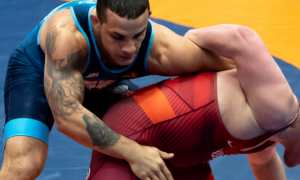 Smith kicked off his latest attempt at making a World Team with an 8-0 tech fall win over Mansur Abdul-Malik (Terrapin Wrestling Club) — two takedowns, two gutwrenches. It was over in the first. But it set up a scintillating semi between he and Wilson. Had Wilson, who is still developing into a viable Senior competitor and was just coming off of a breakthrough performance, discovered the “clicking” moment he needed to take him all the way? Whatever hypotheticals were running through the mind didn’t get a chance to play out. And like Smith’s bout in the quarters, time never became a factor. Right away, Smith clamped around Wilson for a front headlock try with his back to the edge. He did not have the leverage to make it work. Smith basically pulled Wilson on top of him and four points went the other way. They restarted, but little did they know the end was near. Wilson clinched around Smith and as brought the lock back for a throw, it was Smith who adjusted his hips to land on top. He held Wilson there just long enough to get the fall, and that was that. It’s as whacky of an ending as you could imagine, but one that has Smith in a World Team Trials final for the second time this year. Anthony Riopelle (NMU/OTS) found himself in the semis thanks to his emergence from an entertaining back-and-forth battle with two-time Fargo Junior National champ Haydn Maley (Unattached). Riopelle got on the board first with a four-point headlock but Maley took the lead right back on the strength of a takedown and two subsequent gutwrenches. The floodgates were opened and by the time the dust settled and six minutes of wrestling had passed, it was Riopelle who advanced on the strength of a 13-10 decision. Meanwhile, Trent Osnes (Marines) was also an offensive machine as he put on a blistering performance against NMU’s Keaton Fanning that resulted in a 10-0 technical fall victory. Smith/Wilson went :54. This one went :31, and it had to have been a heartbreaking half-minute for Osnes. The Marine came in on Riopelle and locked around. When he looked to arch back on the throw, Riopelle deftly planted his left hand on the mat and turned into Osnes, catching him on his back. Once again, that’s all it took. 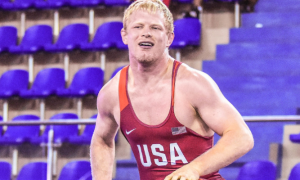 Riopelle with a resounding win via fall to get his first crack at making a World Team roster. The finals and medal matches are scheduled for 3:30pm CT/4:30pm EST and can be viewed live in the US on Trackwrestling.com. 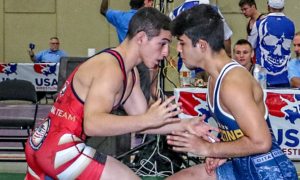 Wrestlers from the Olympic Training Site at Northern Michigan accounted for six semifinalists on the day. There were 16 tech falls and six pins on the championship side of the bracket across all four weight classes. Both 98 kilogram semifinals were ended by falls in the first minute of action.